The two main dishes that I must pull out during the holidays are my parents glazed ham and my mother’s leche flan. This main course and dessert were regulars at our family’s table on Christmas and Easter. I don’t really celebrate these holidays in the religious way, but I do like getting my friends and family in Prague around the table for some eating marathons. On this Easter Sunday, I called a pot luck in honor of a friend’s birthday so this day was a special double bill. My contribution to the feast was Filipino Hamon (Glazed Ham) and Leche Flan. When I travel home to NY or visit another place, a mandatory visit to the grocery store is scheduled into our itinerary. One of the things I am often searching for are cans of evaporated milk. Yes, this is a treasured item in my pantry. On my last trip home, I managed to pack 6 cans in my suitcase and on a recent trip to London brought 2 cans back with me. A good friend even carried a few cans back with her on a recent trip to California. I think that would be the last time she would ask if she could bring me back anything back from the States. Can you see how much it means to me? I can not live without my mom’s caramel vanilla soft custard that just melts in your mouth. 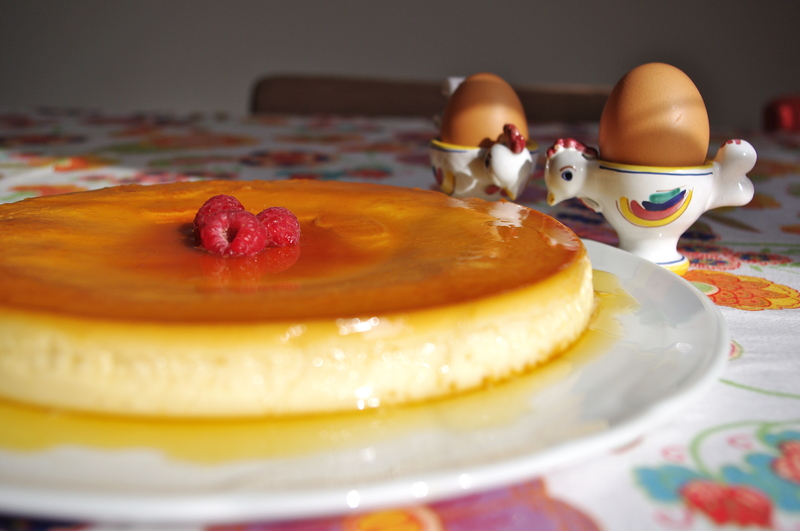 I am aware of the many types of flan recipes out there and many do not call for evaporated milk. However, my mother’s does and hers is the one that I grew up with and nothing can compare. I guess I am just a little old-fashioned when it comes to flan. Leche means milk, therefore, to get that state of perfection I never worry about the excess baggage weight my few cans of evaporated milk could cause. I do, however, hold my breath when I wheel my suitcases pass the custom guards at Prague airport. Then again, would they really take away my beloved containers of evaporated milk? Honestly, I don’t ever want to find out. Just in case I did have a shortage of these precious cans of milk, I have researched the web for ways to substitute it, and found that it is possible to make at home. However, that would require some extra work and one of the things I love about making this dessert is that it is very effortless and uncomplicated. You only need a few ingredients, then there are a couple of quick steps and an easy clean up. Aside from it being one of the simplest desserts to whip up, it never fails to delight the taste buds. -Over a low flame, hold the pan over the heat and let the sugar caramelize. This can take a few minutes. This is the trickiest part of the recipe. You don’t want to burn any fingers and you don’t want the sugar to burn. As the sugar is melting, swirl the pan around so that the bottom and the edges are evenly coated. Put aside when done. -In a bowl, combine the egg yolks, condensed and evaporated milks, along with the grated lime zest and vanilla. Stir and mix all ingredients well. -Pour into the baking pan. Cover pan with foil. -Using a larger baking pan that can hold the flan, place it in the oven filled halfway with water. -Then place the flan inside the steam bath. -When you are ready to serve it, be sure to carefully flip the flan over to display the beautiful caramelized top and let the syrup fall along the sides. I usually slide a knife along the rim to loosen it and then take the platter where it will be served, place it on top and flip it over as quickly as possible. Garnish with mint or berries. Filed under Pinay at Heart, Prague Inspires!